This project is the perfect activity idea for the kids this Easter! Turn a beautiful embroidery design into a fun and creative project for the kids by stitching out these stunning Lindee Goodall designs for the kids to colour in with colouring pencils, crayons, ink or even paint. Lindee Goodall has created a beautiful embroidery pack containing six richly detailed vintage Easter bunny designs as multi-colour and monochromatic. The minimum hoop size for the smallest designs is 5 x 7" (130mm x 180mm). View this collection on the Echidna online shop. Simply add multiple designs together to create a colouring-in book to keep the kids entertained. 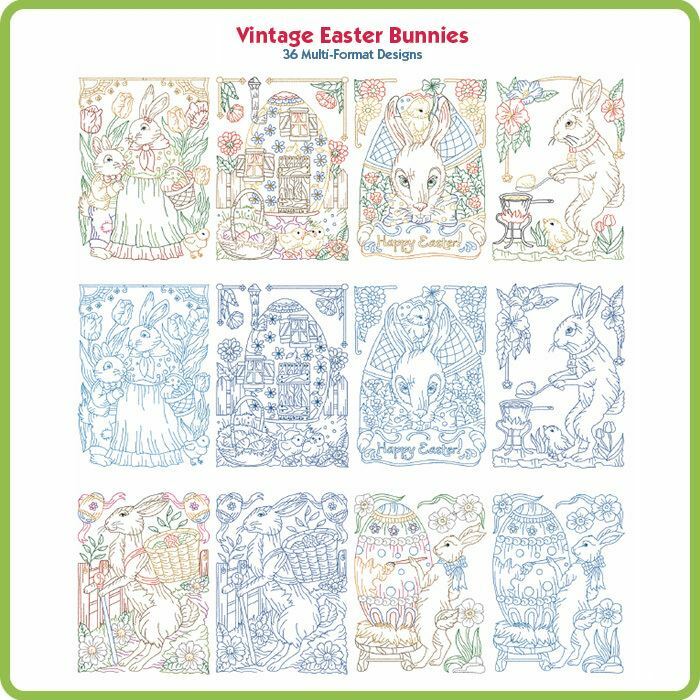 Lindee Goodall CD collection contains six richly detailed vintage Easter bunny line art designs as multi-color, as well as six in monochromatic. Minimum hoop size for smallest designs is 5x7 (130 x 180mm).